10 knives with character and greater possibilities. This first set is both the genesis and hallmark of the brand. 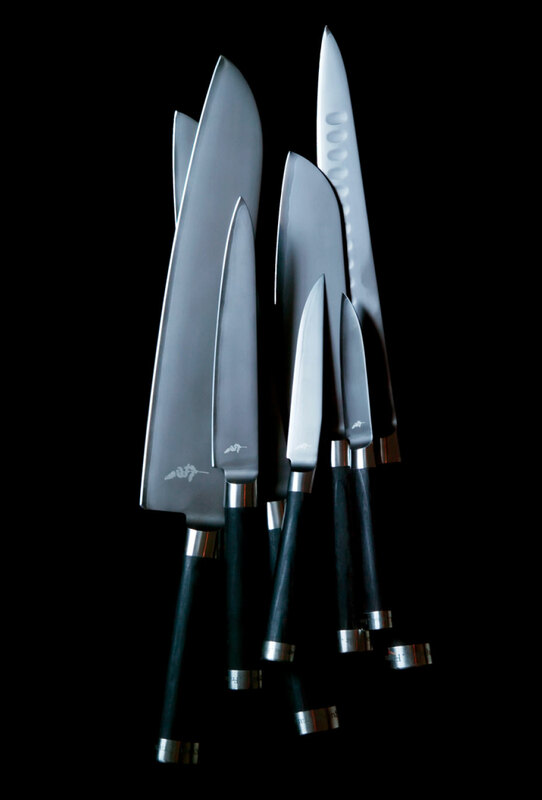 The knives embody Michel Bras’ ideal of perfection both in terms of functionality and beauty. The blade’s delicate cutting edge is comprised of three layers: rigid stainless steel is inserted between two layers of a more flexible stainless steel to create better resistance. A titanium coating is added to seal and add brilliance. The handle is made of black laminated wood resistant to water and humidity, and is silky to the touch. The lower end of the knife is in a distinct chestnut shape, characteristic of Japanese knives. The handle is designed to fit in the hand so naturally that the user will forget that it is not part of their arm. The knives, like some jewelry undergo a total of thirty-seven processes including handcrafting by experienced artisans before they reach completion.